Welcome to Stadium Cards and Comics! 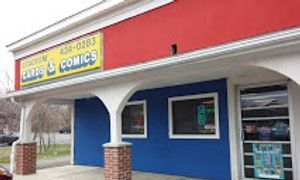 Stadium Cards and Comics is the place for all of your Sports, Comic, and Gaming needs! We have the best selection in the area! From single comics, trade paperbacks, back issues, sports cards, sports boxes, autographed memorabilia, Magic The Gathering singles/boxes, and much, much more! Great gift ideas throughout the store! WE BUY CARDS, and will happily give you an appraisal. Call ahead to schedule an appointment and for more details!